As usual, the release of the Point-in-Time data earlier this month attracted a lot of media attention and spurred important conversations. 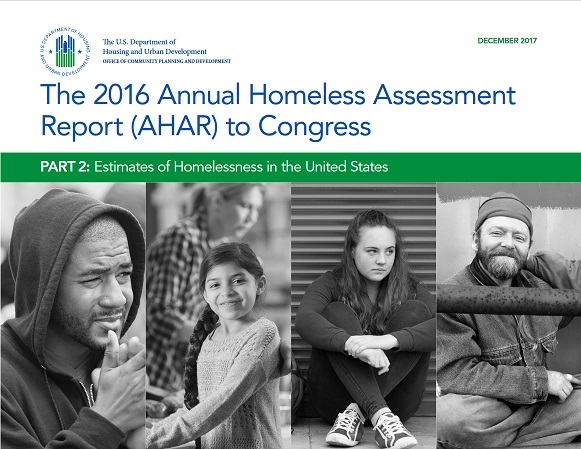 In the midst of that attention, however, HUD’s release of Part 2 of its 2016 Annual Homeless Assessment Report (AHAR) to Congress did not garner much focus—but that data also tells us critical information about the scale and characteristics of homelessness in our country as well. The AHAR Part 2 report includes summaries of the 2016 PIT data (which we analyzed at the beginning of this year), but, most importantly, also utilizes HMIS data to estimate the number—and describe the characteristics—of people who experienced sheltered homelessness at any time between October 2015 and September 2016. Totals: The report estimates that, in total, 1.42 million people used an emergency shelter or transitional housing programs at some point during the year, meaning that 1 in 226 people in the U.S. experienced sheltered homelessness at some point in 2016. This represented a 4.3% decline, or 63,380 fewer people who experienced sheltered homelessness at some point during the reporting year compared to the previous year. Families with Children: People in families with children (at least one adult and one child under age 18) comprised an estimated 481,410 (or 33.9%) of the people who experienced sheltered homelessness during the year. Of these 481,410 people, 60.8% were children under age 18, 30.2% were children under age 6, and 6.5% were infants less than 1 year old. These children were a part of 147,355 family households. The number of family households who used a shelter or transitional housing program at some point during the year declined by 4.6% (or 7,025 households) compared to the previous year. Veterans: An estimated 124,709 Veterans experienced sheltered homelessness during the reporting year. This represented a 6.1% decline (8,138 fewer Veterans) between 2015 and 2016, but still represented one out of every 177 Veterans in the U.S. Whereas Veterans make up 8.9% of the U.S. adult population, they made up 11.3% of adults who used shelter or transitional housing programs during the year. Other Specific Populations: Older adults (age 62 or older) made up 4.7% of people who experienced sheltered homelessness, while representing 18.3% of all people in the U.S., an increase from 4.2% in 2015 and from 2.9% in 2007. For unaccompanied youth and people experiencing chronic homelessness, one-year estimates are not available from this data, so the AHAR Part 2 only summarizes the 2016 PIT data for these populations. HMIS-based estimates of people experiencing chronic homelessness are expected to be available for the 2018 AHAR, and future AHAR reports will also use new age categories to describe the use of shelter by unaccompanied youth and parenting youth. Ethnicity and Race: African-Americans comprised 42.6% of the sheltered population, while only representing 12.7% of the total U.S. population. People who identify as Hispanic were slightly underrepresented within the sheltered population (16.9%) compared to the total U.S. population (17.6%). White, non-Hispanic people were underrepresented, comprising 37.5% of those who experienced sheltered homelessness compared to 61.5% of the total U.S. population. The inequitable representation of African-Americans was greatest for families with children—51.7% of people in families with children who used shelter or transitional housing programs identified as African-American or black, 3.8 times higher than the representation of African-Americans among all families with children in the U.S. (13.6%). Gender: Men outnumbered women among adults who experienced sheltered homelessness by 63% to 37%, although this gender representation varies greatly across sub-populations. For instance, more than two-thirds of adult individuals who experienced sheltered homelessness were men (71.2%). Further, 91% of Veterans who experienced sheltered homelessness were men and 9% were women, representing a continued increase in the representation of women Veterans, up from 6.7% in 2009. In contrast, more than three-quarters of adults experiencing sheltered homelessness as part of families with children were women (77.6%). Geographic Location: People experienced sheltered homelessness primarily in principal cities (74.6%) compared to suburban or rural areas (26.4%), while only 35.2% of the U.S. population lives in principal cities and only 39.7% of people living in poverty in the U.S. live in principal cities. The number of people who experienced sheltered homelessness in suburban and rural areas declined 12% (50,991 fewer people) between 2015 and 2016, accounting for 80% of the total decline (63,380 fewer people) between years, a change in the longer-term trend of growth in sheltered homelessness in those areas. We’ll be continuing our analysis of recent data releases regarding housing markets, housing needs, and homelessness, including the Federal Data Summary (Education for Homeless Children and Youth) for School Years 2013-14 to 2015-2016 report and the recent Voices of Youth Count Missed Opportunities report, and assessing all of this data’s implications for our future efforts to prevent and end homelessness. We’ll also be updating our Using Homelessness and Housing Needs Data to Tailor and Drive Local Solutions tool, which highlights how communities can use a variety of different data sources to drive local planning and action, to inform resource investments, and to respond to the different experiences of individuals and families with a fuller array of interventions and opportunities. Let us know what data you want to know more about – or what data you find most useful in your work. We’ve been focusing on looking at new data in recent articles. We’ve looked at how Worst Case Housing Needs Have Gotten … Worse and we’ve examined Further Evidence of Worsening Affordability for Renters. Most recently, we analyzed how the 2017 Point-in-Time Estimates of Homelessness Show Significant Geographic Variations in our Progress Toward Ending Homelessness.